Volterra former psychiatric hospital originated from an economic evaluation. In the XVIII century, the community of Pisa used to send its own mental patients at a dear price to Siena. To save money, the city launched an offer that was met by Volterra. Therefore, the Mendicity Hospice of this town welcomed the initial body of mental patients and, in 1989 the Mental Asylum was established. The first pavilion was erected near a hilltop called Poggio alle Croci. Volterra, formerly the psychiatric asylum, Charcot Pavillion. January 2017. Nikon D810, 24 mm ( 24-120.0 mm ƒ/4) 1/40″ ƒ/8 ISO 64. Volterra, formerly the psychiatric asylum. January 2017. Nikon D810, 46 mm (24-120.0 mm ƒ/4) 1/40″ ƒ/8 ISO 64. Volterra, formerly the psychiatric asylum. January 2017. Nikon D810, 55 mm (24-120.0 mm ƒ/4) 1″ ƒ/8 ISO 64. Volterra, formerly the psychiatric asylum. January 2017. Nikon D810, 120 mm (24-120.0 mm ƒ/4) 2″ ƒ/8 ISO 64. Volterra, formerly the psychiatric asylum. January 2017. Nikon D810, 24 mm (24-120.0 mm ƒ/4) 4″ ƒ/8 ISO 64. Volterra, formerly the psychiatric asylum. January 2017. Nikon D810, 24 mm ( 24-120.0 mm ƒ/4) 1″ ƒ/8 ISO 64. Volterra, formerly the psychiatric asylum. January 2017. Nikon D810, 40 mm ( 24-120.0 mm ƒ/4) 1/3″ ƒ/8 ISO 64. Volterra, formerly the psychiatric asylum. January 2017. Nikon D810, 30 mm ( 24-120.0 mm ƒ/4) 1/60″ ƒ/8 ISO 64. Volterra, formerly the psychiatric asylum. January 2017. Nikon D810, 86 mm ( 24-120.0 mm ƒ/4) 0,8″ ƒ/8 ISO 64. Volterra, formerly the psychiatric asylum. January 2017. Nikon D810, 24 mm (24-120.0 mm ƒ/4) 1/13″ ƒ/8 ISO 64. Volterra, formerly the psychiatric asylum. January 2017. Nikon D810, 24 mm ( 24-120.0 mm ƒ/4) 30″ ƒ/8 ISO 64. Volterra, formerly the psychiatric asylum. January 2017. Nikon D810, 24 mm ( 24-120.0 mm ƒ/4) 1/13″ ƒ/8 ISO 64. Volterra, formerly the psychiatric asylum. January 2017. Nikon D810, 50 mm (50.0 mm ƒ/1.8) 0.8″ ƒ/8 ISO 64. Volterra, formerly the psychiatric asylum. January 2017. Nikon D810, 24 mm (24.0 mm ƒ/1.4) 0.6″ ƒ/8 ISO 64. Cesare Lombroso Museum, Volterra former psychiatric asylum San Gerolamo, January 2017. Nikon D810, 24 mm (24.0 mm ƒ/1.4) 1/3″ ƒ/2.8 ISO 64. When director Luigi Scabia in 1900 came on board, the hospital was to be considered more a protected area than a place of confinement. To carry on different activities focused on their recovery, patients were allowed to roam freely the pavilions, new ones were built to accomodate more and more guests. The gates stayed open and, here and then, a few patients were seen wandering the alleys of the town. From 150 hospitalizations in 1900, Scabia took the Asylum to 2621 in 1930, when the director died. Then the hospital carried on his philosophy and continued to erect new buildings and kept taking in new patients up to the number of 4794 in 1939. 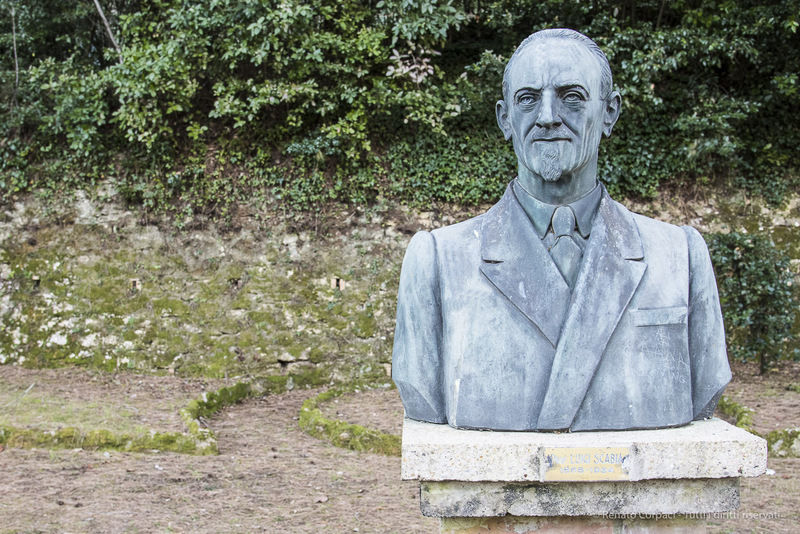 In 1958 Oreste Fernando Nannetti, then a little more than 30 years old, had already spent ten years in a mental hospital in Rome, his birthplace, for insulting a public official. He was transferred to the Ferri Pavilion where the criminal patients where kept in captivity and here a paramedic, Aldo Trafeli, noticed the man who used to spend enormous amount of time attached to the pavilion wall. With a belt buckle he had engaged himself in a gigantic endeavor: a graffiti 180 meter long, two meter high, densely written and drawn, depicting the History Of Humane Dignity. Today, Nannetti’s graffiti is considered a work of art and a mould of part of it is shown in the Collection de l’Art Brut in Lausanne. Law 180 of 1978, called Basaglia, from the visionary psychiatrist Franco Basaglia who promoted it, ruled all mental asylums closed down. 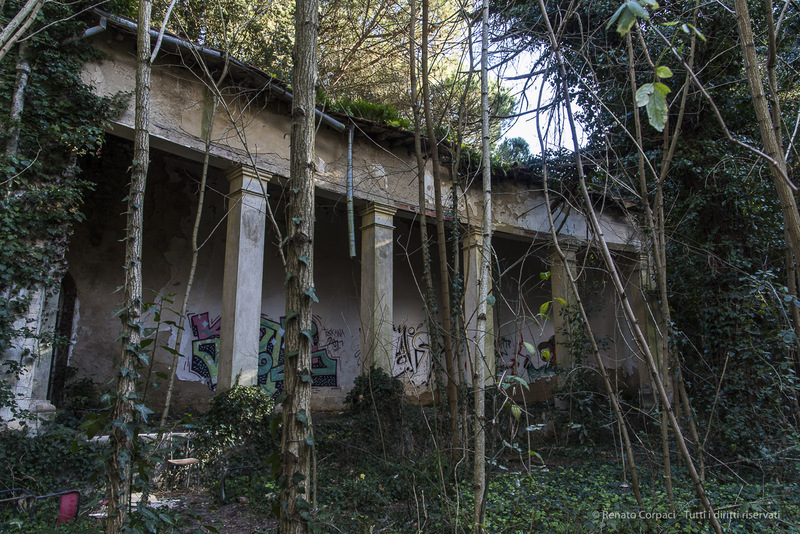 Currently, the pavilions over the Poggio alle Croci are in a complete state of neglect. The area has been sold to the British Indian tycoon Kuldeep Desaur who plans to transform it in a luxury resort with over 200 housing units.